Next-generation enterprise firewalls (NGFW) include intrusion prevention system (IPS) technology that enables them to spot and block cyber attacks. But they do not replace IPS solutions—you need both. 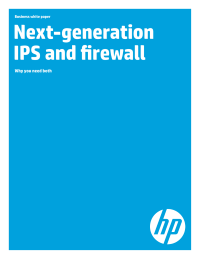 This HP business white paper shows how NGFW and next-generation IPS (NGIPS) are complementary security solutions that work together to secure your network. Firewalls are best at controlling access to the network from outside. They are the security guard at the gate who controls who can enter, whom you can talk to, and about what. third-generation enterprise firewalls are stateful access control devices that inspect deep within the packet stream for potential attacks. They identify and keep track of network conversations (connections) and can associate packets with conversations they have previously allowed based on rules. They also provide other services like network address translation and virtual private network (VPN) concentration.